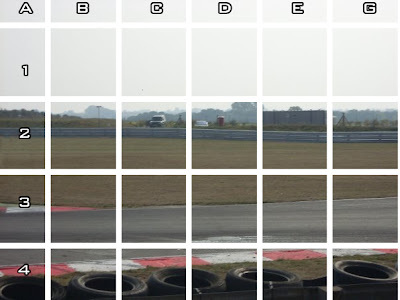 Well here's the answer : The car was in square B2! Well done to everyone who got that right. 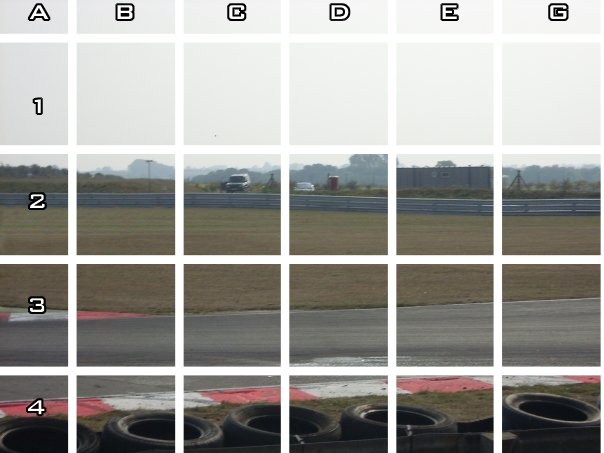 If you've got a suitable picture for Spot the Car, feel free to send it in! Bored with the closed season? Why not try "Spot the Car"? If you are, like us, suffering from those closed season blues waiting for something to happen, why not try our marvellous little game? 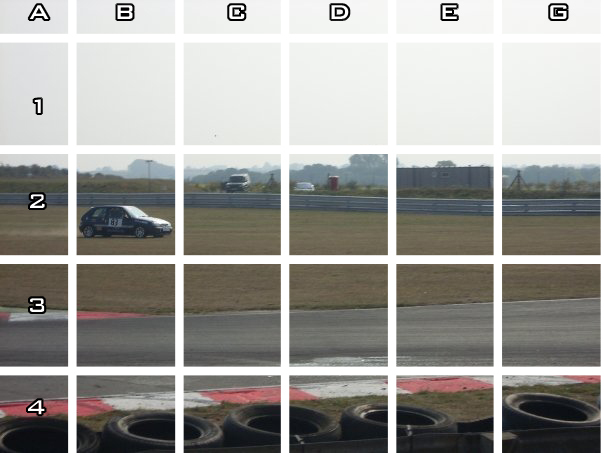 If you've heard of Spot the Ball you'll know what this is - It's Spot the Car! There's no prize involved except for a small amount of kudos. Simply place your answer in the comment box under the picture and the solution will be revealed tomorrow! For the first one, Here's Snetterton, and an unfortunate moment for Stuart Herriot in the Stock Hatch Race. Tweet if you Like Overdrive! You can keep in touch with the latest developments with Overdrive not only here on the blog, on You Tube (new account coming soon), but also via Facebook and Twitter. We would love to hear your comments on the programme (which you can still watch below) to help us make the first series utterly fantastic! So now you can tweet your comments to us, like us on Facebook and tell us there, Comment on You Tube, or just simply E-mail us your thoughts! The first series of Overdrive is nearly ready to start production. We have the features that we want to film, and now it's a case of getting the funding together and filming it through January to March - with the first programme due to hit the web in April 2011 - It's going to be a very busy few months for us! Keep an eye on the site, or the social networks for the latest updates... Watch this space! This month, Paul Gardner takes us on a trip around Llandow Circuit in South Wales, whilst David Malins investigates the finer points of Autotesting. We're already hard at work planning next season's programmes which will follow the same format, but with even more content. Watch this space for news and developments! Overdrive is the UK's first moving motorsport Magazine and it will be packed full of features from track guides, latest news from British Motorsport and the specialist car scene. The first edition will be out soon, but for now, enjoy a quick ride around Llandow Circuit.